As Jed points out, “an idea is only the first step in innovation, and it’s by far the easiest step”. Yahoo! Hack Day was created precisely to summon and celebrate the hard step of innovation: the build it step. The goal is simple: take an idea and make it real — in 24 hours. Spend all day and all night coding until a working, useable, if brittle prototype of your idea emerges. Then show it off. 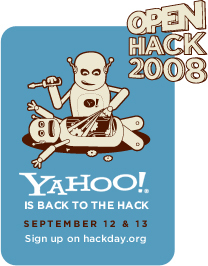 Hack Day is a religion inside Yahoo!, but on September 12-13, 2008, Yahoo! will open up its Sunnyvale campus, inviting any developer who feels like it to join the geek-out frenzy. Sign up here. 8am-6pm PT Friday: Over 20 workshops covering YUI and the newest API offerings from Yahoo!, including BOSS, SearchMonkey, Fire Eagle, and more, and previews of what’s next. 8pm Friday: A surprise musical guest takes the stage (it’s not 2006 guest Beck, but apparently the lyrics are “hacker-friendly” and “may not be appropriate for young children”). Hacking continues all night. 2pm Saturday: Judging, including a special hack-off for the winners of the University Hack Days. At the first Open Hack Day in 2006 in Sunnyvale (see photos), 400 developers fueled by 500 pizzas and a live Beck performance cranked out 54 hacks. At Open Hack Day London lightening struck twice and it rained indoors. Bangalore followed. Why Hack Day? Many an engineer join Jed in lamenting how the PowerPointy set co-opted the term innovation, rendering it almost meaningless. Hack Day was created in part to reclaim innovation for the makers. Why does it work? Hack Day is to programmers what NaNoWriMo is to writers: a timed artistic challenge that on it’s face is a ludicrous and artificial pretense for accomplishing a goal. Yet somehow the exercise induces a psychological state perfect for making progress on the initial “80% phase” of creation. The punishing deadline forces all meta processing aside — no critic, no perfectionist, no planner, no lazy dreamer — and encourages the raw energy embodied by Nike’s Kirk-beats-Spock slogan “just do it”. A number of Yahoo! products, services, and features were born on a Hack Day (here are two). Yoopick was too. Update 2008/09/26: CNET says: Yahoo Open: Finally, a real answer to Google. Also, Google spouse Kara Swisher gets defensive and rewrites history. Previous PostNew Yahoo! News election dashboardNext PostPolitical ads: Insuring your message gets across. Literally. Thanks Mohammad for the pointer: interesting perspectives.